Two Yapton developments totalling 550 new homes have both been given the go-ahead by councillors. Gleeson Strategic Land is seeking permission for 250 homes west of Bilsham Road, while Landlink Estates has submitted a scheme for 300 homes on another parcel of land east of Drove Lane. The two developments abut each other and were both approved unanimously by Arun District Council’s development control committee on Wednesday (January 23). Both schemes have received more than 100 letters of objection from residents raising concerns about sustainability, impact on roads and infrastructure as well as the loss of green space and countryside. Stephen Haymes (Con, Yapton) said he was aware of people’s feelings about the applications with people not wanting the village to be overtaken by large developments. But since the land was included as a strategic site within the Arun local plan he suggested development ‘is inevitable’. 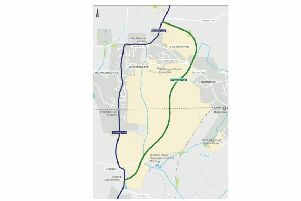 He welcomed plans to invest in the existing primary school rather than building a second one as well as proposals for a cycle route between Yapton and Barnham. Although backing junction improvements he argued that works to Comet Corner should take priority over those planned for the Oystercatcher. Meanwhile on health care his preference was for a new medical facility as part of the strategic housing allocation at Ford. Adam Ross, speaking on behalf of Gleeson, described how although the applications are separate the two schemes had been designed in a cohesive way, with a large area of open space in the middle of the two parcels of land. Paul Hanson, chief executive of Landlink Estates, suggested the schemes once finished would become a ‘much-loved part of Yapton that will enhance and compliment the village’.